Sadly nothing new has been completed from my sewing room this week because it turns out that I am part of the 1% of the population who adversely reacts to the flu vaccine, and I have been very sick for most of this week. It just pains me to have several days of uninterrupted time at home that I could have used sewing up a storm, but I was too sick to even get out of bed and watch crappy daytime telly let alone get anywhere near my sewing machine. But I'd say I've caught up on any sleep deficit I may have had, so there is a silver lining to that cloud. But now it is a sunny Sunday and I am feeling well (just in time for work tomorrow, oh joy!) and the husband and I are heading out to dinner later this afternoon to celebrate my return to the world of the well (and my brother's birthday). However to keep up with my personal goal of blogging at least twice weekly I am going to post about something I made earlier this year. Actually since I've been sewing for eons but only blogging for a few months I do have a lot of older creations that are unphotographed and unheralded, but I may start interspersing them with more recent completions in my posts just to give them their time in the sun too. I made this sleeveless top from the leftover waffle weave cotton that I used to make the Louis Vuitton inspired suit I blogged about here. The fabric was too pretty to waste, but not quite enough, so paired with some other fabric scraps in black, I morphed this now OOP New Look pattern dress into a top but cutting at the waist and using a shorter zip in the back. Incidentally my mum made this pattern into an ankle length dress made of maroon microfibre with cream straps for my year 10 formal (ie 'prom' in US terminology) way back in 1993. You won't be seeing that photo (even though the dress was finished superbly, yay mum you rock) because it features way too much metal on my teeth, but here's a photo of the pattern instead. I've worn this top a few times to work, under a black pants suit (purchased RTW, shock horror!) and my favourite black patent heels and it makes me feel very glamourous indeed. In the photo I've worn a chunky black bead necklace that came with last month's InStyle magazine by the designer Claire Aristides - total score for a freebie. But I took it off before I went to work - it felt a little too OTT for my rather staid office, well a little more OTT than usual for me! All in all I'm rather proud of this creation - very thriftily made from offcuts and it totally lifts a plain black suit. Like many dedicated sewers I have a lot of sewing patterns. And I mean a lot. At present count 587 individual pattern envelopes, plus those in the Burda magazines and the vintage Australian Home Journal magazines (a sort of mid century Australian version of Burda). And I cannot bring myself to destash in any way, even the fugliest patterns I know I'll never use, but who knows if some distant future relative of mine won't think it's a goldmine they way we love vintage patterns now. I’ve tried a number of systems to keep track of them. Firstly I had them all in square archive boxes, grouped together by type of pattern (dresses, skirts, shirts etc) but this was complicated by those wardrobe patterns with multiple patterns in the one, still having to rummage through the boxes and the six boxes required to house them when stacked on top of each other reached the ceiling. So the next phase was to scan all the patterns one time when I was home sick with the flu for two weeks, which meant I didn’t have to rummage through the boxes to see what patterns I had but still meant they physically took up a lot of space. Then I stumbled across an unassuming but oh so helpful piece of furniture from Ikea of all places: the Aneboda chest of drawers. Three drawers, deep enough for patterns to stand on end, even the big Vogue envelopes, and wide enough to fit five rows of standard pattern envelopes across. I managed to fit all 587 pattern envelopes in the chest of drawers and there’s room for more (oh don’t worry I’ll fill it in time and will have to get a sister for it). It takes up so little room, but fits them in so efficiently and neatly, all the patterns are lined up nicely like little soldiers ready to take on the fabric stash. I have them ordered by pattern company in numerical order (the whole top drawer are Simplicity patterns alone!). So now I can browse through the scanned patterns to see what I have and which I want to use, and easily find what I’m looking for. Over at Ikea Hacker someone customized their Aneboda by covering up the semi opaque plastic fronts with coloured paper, but I like being able to see the patterns in there, all those lovely ladies on the covers begging me silently with their eyes to be the next chosen one. Anyway, Ikea is all over the world and it’s more than likely that there is one near you. Give the Aneboda a go, it may just change your world (or at least clean up your sewing room). And the best thing? My husband congratulated me on coming to my senses and throwing out some patterns. Ha ha ha, little does he know! My mum was reminiscing about this pattern she made in her younger days (aka pre kids) in a floral cotton which she more than likely wore with cork wedge shoes that were in fashion the first time around. So I thought I would make View 2 into a dress using a black and white pinstripe stretch cotton purchased from the closing down sale at the Home Yardage that used to be in York Street in the city several years ago. I modified the pattern by ditching the puffy sleeves because I feel silly in them, and I replaced the flared skirt with a pencil skirt to suit the pinstripes better and also because the fabric was too stiff to hang nicely in folds as per the pattern envelope. And, some 33 years later here is my take on this pattern. Worn with a red belt and some red shoes (I have about 9 pairs of red shoes to choose from), and paired with a white jacket to wear in my chilly office, it’s the perfect simple outfit for a day in the city during summer. Amazing how a few simple modifications takes a pattern from the past into the present. I finished this a few weeks ago and it has passed the all day wear to work test with flying colours (I find I can never be sure of the fit until an item is worn for a full day). And then I spied a new Vogue pattern 8184 made into these lovely creations on Colette’s blog which in my eyes is a very similar style to the dress I made – I almost feel in fashion for a change (as opposed to being deliberately quirky and different). Generally when I refashion an existing garment, and what I think is universally understood in the blogospheres, it usually involves refashioning an existing bought or thrifted outfit/garment, or wearing it with something new and unusual to make up a new outfit. After it sat in the cupboard for a few years not being worn, I decided to completely rework it to get some better use. First the jacket: I took the arms off to narrow the shoulders, took it in along the princess seams, and cropped it to the hip line in a curve. I also added a row of tortoiseshell style buttons I picked up from an op shop (what a find to get so many matching buttons at once!). And whilst the armscyce is still a bit too low but can’t be fixed after cutting, overall the fit and look is much improved. Worn here with a cotton dress I made from a Vogue Calvin Klein pattern, and some vintage amber beads, it has a completely new lease of life. So with about two days worth of attention I have managed to create two good outfits out of one mediocre outfit, and the clothes can now justify their space in my overcrowded wardrobe. and this is why I sew! 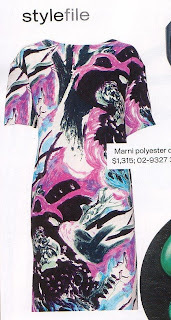 Have a look at this Marni dress that appeared in the latest In Style Australia magazine. Notice anything in particular? It's a rather plain, almost shapeless shift dress style, in a so so print highly reminiscent of the 1980s. It is however, $1315 and it's made of polyester! Yes, POLYESTER! So I showed my husband this photo and told him to stop complaining about my fabric and pattern stash, I'm actually saving us money! In contrast, I whipped up this skirt using some roughly textured linen in a grey with black and white thread slub running through it purchased from an op shop sometime last year. Because I didn't have all that much fabric, the pattern (Vogue 7937) was an excellent choice, because it comprises of six narrow panels, with two vents at the back (I made version A). The panels of the skirt made it easy to get a good fit, and the yoke facing instead of a waistband is super comfy. Modelled here by moi accessorised with a $10 knit top bought on sale, a leather plaited belt from an op shop and blue strappy leather heels bought about two years ago from David Jones on sale. Just call me thrifty! UFOs are taking over my life! Sally commented on my last post that quilters use the term UFOs to describe those WIPs that never get finished - trust me I know that term very well! But here’s a question for you: when does a WIP become a UFO? For me, it’s when I put aside a project because of some frustration, and start on a new project or three. A few months will go by, I will have a clean up of the sewing room, and the WIP in progress will enter what I like to call the cupboard of limbo – much like the waiting room for ghosts in that crappy movie Beetlejuice the cupboard in my sewing room is full of unfinished objects hanging there, taunting me….. Some of the UFOs only need minor work to finish them, such as hemming or a button and it’s just plain laziness on my part that I haven’t finished them. Others need taking apart and major fixing such as resetting a sleeve cap or taking in to make them wearable. However, with so much fabric and patterns, I do get somewhat impatient with the difficult child and like to move on. You know how the fabulous Erin over at A Dress A Day writes her drabbles about the Secret Lives of Dresses, stories of how they were once worn and loved but now are left behind as fashions change and their owners fade? Well I often think that about UFOs: such high hopes were had when pinning the pattern, cutting out the fabric and sewing up those first seams, but something changed, went wrong, and the dress that was once meant to be entered that realm of never was, maybe never will be. Maybe I just think too much, but feeling guilty at wastage of time, fabric and money, I entered sewing purgatory, retrieved the garments waiting for some attention and the opportunity to be worn in the sunlight and made a list (I’m good at list making, completing the task is another matter). There are well over 45 projects on that list, excluding a few complete wadders and a few ‘what was I thinking with that fabric/style’ and will now endeavour to complete a UFO for every new project that I do. Plus the success with the white shift dress that was twelve years in the transition phase of UFO to completed object inspired me. 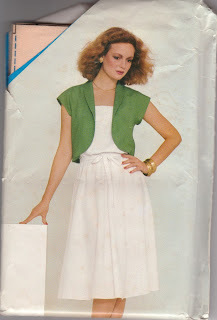 I used this 1980 Style pattern, which indeed was sew simple (just love their pun), but also turned out to be much longer than I imagined, but I think this was because I tend to wear my skirts below the waist and vintage patterns are designed to sit at the waist. And a big thank you to all those who came over from Sew Retro and posted comments both here and at Sew Retro - it made me so excited and grateful to get all those nice comments! And in response to Karen's question about vintage sizing, I find the sizing runs a little large, but since the older patterns don't often give finished garment size I check using flat pattern measurements, a tissue fitting and a lot of finger crossing. Is this worthy of Sew Retro? I hope so, because I have now joined Sew Retro and this is my first project I posted there. I'm in total awe of the amazing things people sew and post there, some of the turn of the century clothes look so complicated, others get such a good fit with their fabric and pattern choices and some talented (gluttons for punishment?) use actual vintage sewing machines as well. Anyway, my contribution is a 1960s Simplicity pattern skirt, purchased from an op shop of course, hence the 50c price sticker on the front. I used a black, white and yellow houndstooth check wool purchased from an op shop, as well as thrifted buttons so all in all a skirt made for probably 1960s prices. I only made a few changes to the pattern - using an invisible zip and installing a lining, two things that I think make skirts look just that little bit more professional. I also didn't change the pattern sizing because even though my measurements are almost 3 inches more than the sizing on the pattern, it had far too much ease for modern day pencil skirt styles and it fit perfectly the way it is. My in laws are currently staying with the husband and I for a few weeks, which brought on a flurry of activity before they arrived including cleaning the yard and the house, especially the guest room which had become a bit of a dumping room for washing, ironing and everything else. The fabric is a yellow/lime green upholstery weight cotton that I bought a whole roll of in an op shop last year for some ridiculously cheap price. The fabric does wrinkle a little which is evident in the photo, but they are casual chair so I'm not too worried about that. The foam however was ridiculously expensive - about $140 all up! Anyway sewing was relatively easy, they are just simple box shapes with a zipper at the back, although getting the corners right is a little fussy. I also made matching piping (about 18m of it!) and this project whilst simple was quite time consuming and frankly a little boring. I am happy with the way the project turned out, it has created a little corner under the skylight that is just right for reading the paper. Continuing the theme from the last post, I made another item of summer style clothing even though it is now the end of summer..... Good timing is rarely my forte. And yes, that is my crazy dalmatian hiding there in the background. Every time I took a photo using the timer he would run into the frame at just the right minute! 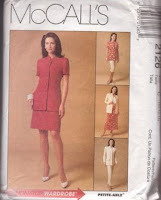 The pattern I used is a now OOP Butterick See & Sew 5032 picked up in an op shop as well, which is a pattern for a dress and the little bolero jacket. My version turned out exactly as the pattern envelope with the exception that I added a timber button to the front. I hadn't realised how short the jacket would be, since the pattern photo obviously was taken in the days well before hipster styles were in and waistlines were actually at the waist. No date on the pattern but I'm guessing sometime in the 1980s, which is practically vintage these days given it's 20 years ago now. So here in Australia the end of February spells the end of summer, although this year summer has been rather cold and rainy which is entirely good news for the decade long drought that has plagued Australia and I did get to spend six weeks in south east Asia where it was pretty hot anyway, so I'm not complaining. This was so quick and simple to make I can't really explain why I didn't make it sooner. I made some modifications to the pattern: I lengthened it and made a self tie belt to reduce the potential for maternity based questions and I lengthened the sleeves a bit because cap sleeves aren't really my favourite look. All in all a really nice look that I may play around with to make a little formal for work such as deleting the puffiness to the sleeves and using a single pleat in the front instead of gathers, or making it more voluminous for when I really do need it for naternity purposes. Next up I'm working on some vintage numbers so I can introduce myself over on Sew Retro properly now that I have procured an invitation.